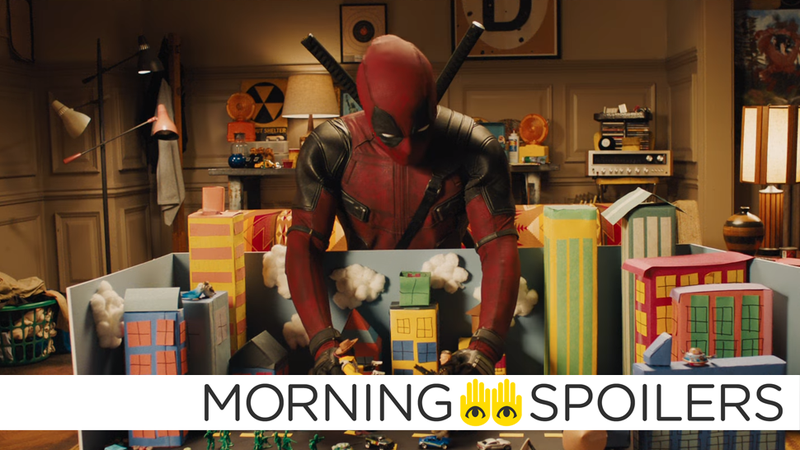 Who on Earth Could Be Deadpool 2's Secret New Cameo? I bet you it’s Sheriff Deadpool. Get a look at Shazam!’s electrifying new logo. Peyton Reed discusses Wasp’s important role in Ant-Man and The Wasp. Preacher adds a few more intriguing new characters. Plus, footage from the season finale of The X-Files, Ryan Murphy confirms a few more familiar faces for American Horror Story, and more. To me, my Spoilers! A new report from The Hollywood Reporter about the film’s reshoots and recent test screenings also includes an intriguing claim that at least one additional reshoot involved several hours in Los Angeles to add a “secret cameo” to the film. Time to start speculating wildly in the comments! It was nothing that had gone wrong. I think it’s a common misconception too – that people think that reshoots are to fix things that people didn’t like. A lot of the time, reshoots are to add more of the things that people loved. [Filmmakers] watch their films again and are like “better fix that”. I don’t know how much I can say about that. Usually films hate it when you talk about their reshoots – solely because people think that it’s because the film was bad for the test audience – but it was all good. In a Facebook post, Fred Dekker confirmed he’s currently in Vancouver filming reshoots on The Predator. In the latest issue of Empire magazine, director Peyton Reed stated Ant-Man & The Wasp is “not a romantic comedy,” as previously advertised. It was important to me, in this movie called Ant-Man and The Wasp, that she’s not a supporting character. She’s a lead character. She really was, along with Sue Storm of the Fantastic Four, one of the first female Marvel heroes. I feel a certain responsibility with The Wasp. This one explores the different generations of Ant-Man and The Wasp. I thought that was an interesting thing we haven’t seen in a Marvel movie. It’s not a romantic comedy. The idea might enter Hope’s brain: does she need Scott Lang in her life? The new logo for the film has been revealed via the movie’s twitter account. Warner Bros. is currently celebrating “Rampage Week” on the film’s official Twitter, which includes daily posters and an AR contest adjudicated by Dwayne Johnson, himself. Empire Magazine has also released all six variant covers of their upcoming Infinity War issue. Speaking with the Toronto Sun, Robert Downey Jr. cited the scene where Thor meets the Guardians of the Galaxy as his favorite in the movie. My favorite shot in the movie has already been seen, and it’s when Thor, who’s just totally gnarled up, turns and goes, ‘Who the hell are you guys?’ and you cut to the Guardians [of the Galaxy]. I’m like sold. If the whole third movie was that scene, we’re fine. Allison Williams has joined the cast in a currently undisclosed role. Ryan Murphy has confirmed to Entertainment Weekly both Kathy Bates and Evan Peters will return for season eight. Talkies Network captured a set photo of a trailer labeled “Stunt Maroni 1,” indicating mob boss Sal Maroni will make an appearance on the series. Following Supernatural’s crossover with Scooby-Doo, Stephen Amell stated he hopes the CW will consider a Pinky & the Brain crossover with Arrow. Spoiler TV has pictures from the first two episodes of season two. Click through for more. Meanwhile, here’s an extremely terse synopsis for episode 3 of season 2, “Chapter 11.” courtesy of Spoiler TV.